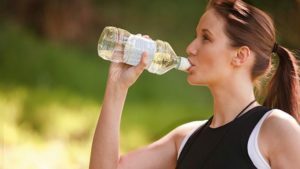 Drinking too much or being dehydrated can decrease your workout productivity. To determine if you are well hydrated, take a look at your urine volume and color. If your urine is light yellow in color and you are going on a regular basis (every 3 to 4 hours), you are well hydrated. If your urine is dark, you are dehydrated. It is important to make sure you are well hydrated before working out. It is recommended to drink between 8 to 16 ounces of water 15 minutes before your workout. During your workout, it is recommended to drink 4 to 8 ounces every 15-20 minutes. If you are working out vigorously for over 90 minutes, it is recommended you drink 8 to 10 ounces of a sports drink every 15 to 30 minutes. Hydration isn’t just important during physical activity. Sitting in the sun on a hot or humid day can cause dehydration. Being thirsty isn’t the best indicator of your need to hydrate, as it means you are already dehydrated. A good rule of thumb to tell if you are properly hydrated is to pay attention to the color of your urine. Pale and clear urine means you’re well hydrated. Dark urine means drink more fluids. Drinking water is the best way to stay hydrated. Also, certain foods include a high percentage of water, such as fruits and vegetables.